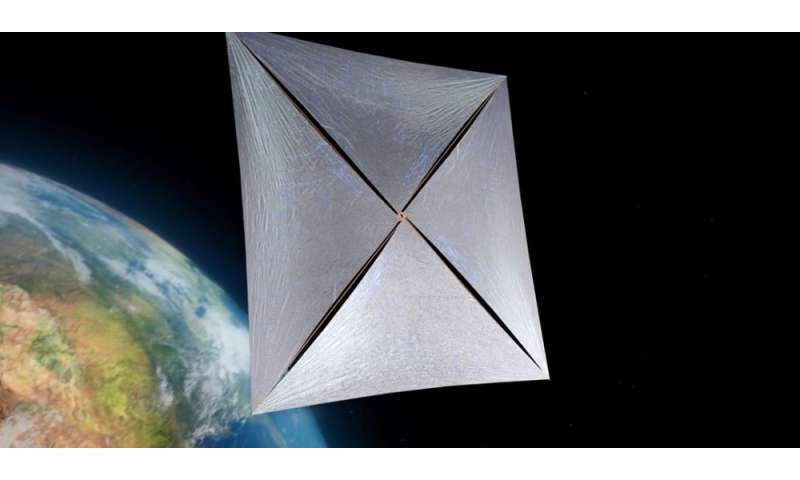 Breakthrough Starshot is a project launched by backer Yuri Milner two years ago—its aim is to send a spacecraft out of the solar system toward Alpha Centauri by the middle of this century. Most designs for such a spacecraft surround the idea of a light sail and a tiny device to allow for communications. The craft would be powered by a laser array situated on Earth. To reach Alpha Centauri in a reasonable amount of time, the craft will need to travel very fast, close to 20 percent of the speed of light. Alpha Centauri is, after all, 4.37 light years away. And while the concept is relatively simple, the design presents serious challenges, as the team highlights. A light sail can be pushed by beams from a laser due to momentum carried by photons, the researchers note. But for it to work, the sail must be reflective. It will also have to be very thin (perhaps just a few atoms across) and lightweight, less than a gram. Thus far, engineers have looked at graphene, but it is not reflective, which means it would need a coating of some sort. On the other hand, reflective materials such as metals are too heavy. A suitable material has not yet been found, the team reports. Another challenge the team will face is how to keep multiple laser beams steady and focused as they pass through the Earth's atmosphere. That will likely mean use of low near-infrared beams, which means the sail would have to be able to reflect such wavelengths of light. But then issues of weight and heat generation come into play. Such issues, the team notes, mean that engineers will have to balance many factors to find just the right combination of materials. Something else the team will have to consider is the shape of the sail—it will not likely be a simple flat sheet, because imperfections on its surface would send the craft careening off into space. Instead, engineers will have to develop a design that allows for self-correction. "scientists at Beihang University in China and The University of Texas at Dallas has developed high-strength, super-tough sheets of carbon that can be inexpensively fabricated at low temperatures... high electrical conductivity and are able to shield against electromagnetic radiation. These properties make these sequentially bridged graphene sheets reallysweet..."
"Hematene joins parade of new 2-D materials—Team extracts 3-atom-thick sheets from common iron oxide"
"The addition of the plasmonic silver nanoparticles to graphene also increased the material's ability to boost the efficiency of graphene-based solar cells by 11 fold, Berry said." "The materials that they used include sheets of chromium tri-iodide (CrI3), a material described in 2017 as the first ever 2-D magnetic insulator. Four sheets—each only atoms thick"
I would suggest that whichever materials are chosen. That those materials include some sort of built-in means for self-repair. The only way to get to nearby stars is resurrecting Project Orion. Not solar sails, not exotic drives with completely unobtainable technology. You sure it ever died? "Anatolij Perminov, head of the Russian Federal Space Agency, announced[when?] that it is going to develop a nuclear-powered spacecraft for deep space travel... This system would consist of a space nuclear power and the matrix of ion engines. "...Hot inert gas temperature of 1500 °C from the reactor turns turbines. The turbine turns the generator and compressor, which circulates the working fluid in a closed circuit. The working fluid is cooled in the radiator. The generator produces electricity for the same ion (plasma) engine... journey to Mars with nuclear propulsion and a steady acceleration would take six weeks... planned date for the first reactor tests is set for 2018..."